The original title of Ozu's masterpiece, EARLY SUMMER, means 'Autumn of Barley'. It may sound tranquil at surface, but Ozu tried to embed fading memories of the war in this seemingly innocuous title. 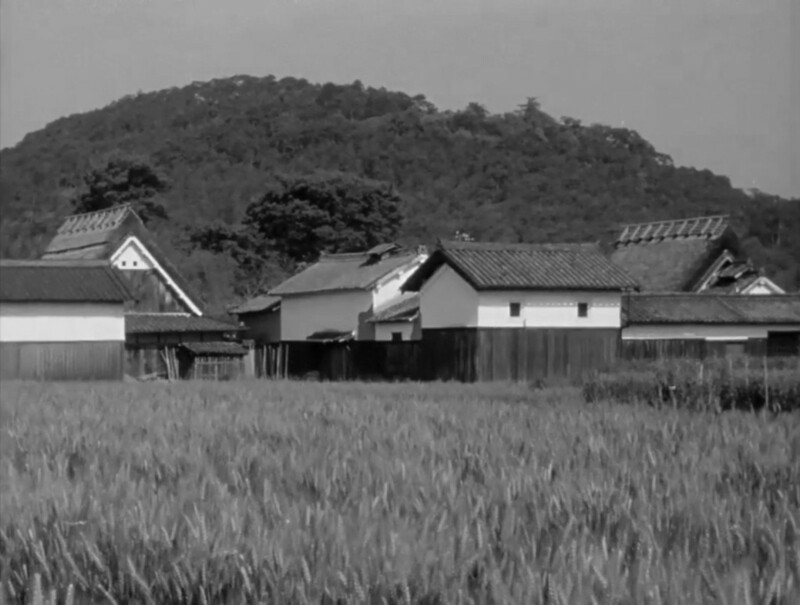 During the last sequence of Ozu’s EARLY SUMMER (麦秋, 1951), the camera captures gentle waves of barley field, almost ready for harvest. As the title suggests, it is early summer, the season of fresh air of life. Incidentally, the original Japanese title, “Autumn of Barley”, is a cunning choice of words: it implies both youth and old, being summer and autumn at the same time. It suggests a long arc of life, of Noriko, Shukichi or Shige. However, the image of the barley field might have evoked ambiguously sour memory in the contemporary audience: aimless invasion and lost souls of their brothers. Thus the last image, accompanied by the return of the children’s choir used in the opening credits, finally anchors the title – correctly translated, not ‘Early Summer’ but The Barley-Harvest Season. The shot uses an utterly and specifically cinematic device to freshen up the clichéd theme of momentary change within overarching stability. And it supplies a climax to the film’s additive stylistic development, its ‘unfolding dynamic integrity’. Noriko Mamiya’s elder brother, Shoji, was killed in the war. Or, the Mamiyas assumes he was killed in the war, because there has been no news from him for over a decade. Shoji’s absence is a huge void in the family – whenever the topic of the lost son is brought up, the conversation tails off into silence. In the discussion of thematic continuity across Ozu’s films, Masumi Tanaka points out that “Shoji/Shojiro” seems to be a pivotal recurring character in a string of Ozu’s films from war years to post-war years. In BROTHERS AND SISTERS OF THE TODA FAMILY (戸田家の兄妹, 1941), Shojiro Toda (played by Shin Saburi) is the second eldest son of the Toda family, whose carefree manner and laidback mentality are out of sync with his father or elder brother. After their father’s death, however, the other members of the family, notably the eldest son, take little care of their widowed mother and youngest sister, which infuriates Shojiro when he finds out his mother and the sister living in seclusion. Significantly, in the last sequence, Shojiro speaks of a plan to relocate to Manchuria, taking the mother and the sister along with him. In hindsight, it is a doomed plan. After the war, Ozu wrote the screenplay for THE MOON HAS RISEN (月は上りぬ, 1955) in 1947, as a possible follow-up to RECORD OF A TENEMENT GENTLEMAN (長屋紳士録, 1947). (After many years of erratic starts and stops, the film was finally directed by Kinuyo Tanaka.) Masumi Tanaka suggests Shoji in THE MOON HAS RISEN is a reincarnation of Shojiro in BROTHERS AND SISTERS OF THE TODA FAMILY pointing out character traits of the two are similar and symbolic significance is eminent. However, postwar disillusion seems to have caught up with him finally. Shoji in EARLY SUMMER and another Shoji in TOKYO STORY (東京物語, 1952) are absent from both films: they were killed in the war. Being the second eldest son in his own family himself, Ozu might have projected his own (ideal) image on “Shoji/ro”. Then, it is all the more significant that “Shoji/ro” in his postwar works becomes a void created by the war. Did Ozu feel so alienated that he had no place in the postwar landscape? The sentiments in LATE SPRING (晩春, 1949), or TOKYO STORY do suggest such abandonment and sense of perpetual loss. Then, what happened to “Shoji/ro” during the war years? To answer that question, it may be helpful to explore the significance of ‘ears of wheat’, the farewell token sent from Shoji. We learn that Shoji was sent to China and participated in the Battle of Xuzhou (April – June, 1938). The battle was one of many troubled military actions provoked by the expansionist North China Area Army of Japan in the thirties. “Wheat and Soldiers” is a first book of trilogy written by Ashihei Hino, who participated in the Battle of Xuzhou as a member of Army PR division. This story was originally published in the magazine ‘Kaizo’ in August 1938 (maybe a bit earlier) as a reportage of the campaign. The Battle of Xuzhou was often associated with wheat, since the soldiers struggled through the vast wheat field in the area during the combat. The association was coined by the Hino’s bestseller, which also started the wave of multimedia propaganda campaign, including a song called “Wheat and Soldiers”. Hino eventually published two more novels, “Earth and Soldiers” and “Flowers and Soldiers”, which formed “Soldiers Trilogy”. It was one of the most popular novels during war years and considered the most important war literature in Japanese even today. When this “Wheat and Soldiers” fad was developing in Japanese media, Yasujiro Ozu was fighting in China as Corporal in Gas Unit in Shanghai Expeditionary Army, experiencing numerous no-nonsense combats in first hand. As a real soldier in the field, he was known to be critical of Hino’s propagandistic trilogy. In one of the entry in his journal, Ozu slammed the bestseller as “a pulp book for teenage boys”. As in the case for “Wheat and Soldiers”, I also wish there should be more psychological aspects of soldiers in “Earth and Soldiers”. As it is, this book remains to be a pulp book for teenage boys. Soldiers do feel homesick and whatnot, but such a simple-minded soldier does not exist in this unit. “Record of desperate fight by Ashihei Hino” – it would be no surprise to me if the book were called his achievement report in the style of “something for everyone”, by his superior and comrades. In this context, Yabe’s mention of “Wheat and Soldiers” and Shoji’s ‘ear of wheat’ may suggest something more than just a loss of a friend. Presence of ‘ear of wheat’ from the battle field in China is something actual and concrete, but poignantly symbolizes a desperately vast distance, the distance between a soldier in a battle field and people at home. Yabe, who had been safely at home at the time, may have felt sympathetic toward ‘soldiers’, but it was precisely the effect the military was seeking when Army PR Division instructed Hino to write a reportage on a life of an ordinary Japanese soldier fighting in China. The year 1938 became a turning point in cultural propaganda in Japanese history. One of the most crucial battles in this year was Battle of Xuzhou, and Army took advantage of this opportunity to politicize popular culture – literature, film, music and any form of art – at home. But the main reason for this political move does not appear to be Battle of Xuzhou itself, but one before that – Battle of Nanjing (December 1937). In December 1937, Japanese Army advanced from Shanghai and invaded Nanjing, the capital of Republic of China. On December 13, 6th and 116th of Japanese Army entered the city. For weeks, Japanese soldiers committed the most gruesome and horrifying inhumane act on Chinese people. The exact number of victims is still unknown, but even the most modest numbers estimated by a conservative scholar is between 20,000 and 30,000. The invasion and capture of the city were reported gloriously in Japanese newspapers and media. In contrast, there was almost no mention of the massacre. The newspapers already had been under severe pressure from the Japanese government since the failed military coup d’etat in 1936. They never reported strategic failure, atrocities or any kind of incident that might illicit negative public sentiment about military actions in China and printed only victorious stories, emphasizing noble sacrifice of Japanese soldiers. Some news agencies or outlets assigned popular journalists, writers and novelists and dispatched them to the war front, hoping to get an angle which the other agencies may be missing out. One of the writers dispatched by Chuo Kouron, the popular magazine, was Tatsuo Ishikawa. Ishikawa published ‘Sobo’ in 1935, which was awarded the Akutagawa prize. He already established himself as a serious writer at the time of Battle of Nanjing and sent to the captured city by the editors of Chuo Kouron. His novel, “A Living Soldier”, published three months later in March 1938, was full of gruesome details of atrocities and depicted Japanese soldiers in unfavorable light. It was immediately banned by the Government. He was indicted on charge of violation of Newspaper Act, and sentenced to four month in prison with four year probation. In the preface to the first edition of the banned book, Ishikawa explained why he decided to write an honest report of the incidents in Nanjing. My intention was, by reporting the war as it is, to urge people at home, who were so soaked with the victory, to reflect on their arrogant attitude. Ishikawa was the only person among the dispatched writers who tried to convey the reality of the atrocities. Others, including Souichi Oya, Fumiko Hayashi, Yato Saijo, didn’t mention anything, even a single sentence, about the massacre. Ashihei Hino was also in Nanjing in December 1937, but not as a reporter, but as a soldier. His letters from this period, discovered long after the war ended, contained many passages about the atrocities committed by his comrades and himself. He wrote, his comrades began stubbing dozens of captured Chinese soldiers and he finished off an old Chinese soldier who was already dying from stab wounds. Japanese Army HQ and Cabinet Information Department prohibited any news reporting of this massacre. Then, they hurriedly initiated various process of domestic media control and planned to counteract the media overseas which were reporting the atrocities committed by Japanese Army. On December 27, 1937, the Literature Section of the Police Bureau had an ‘open-discussion’ meeting and named seven writers, including Shigeharu Nakano and Yuriko Miyamoto, as ‘blacklisted’ – that is, these seven writers were not allowed to publish anything. They were considered as leftists, ex-communists, or labor-friendly. On December 31, Cabinet Information Department decided to hold ‘Propaganda Expo’ in the following February. The Expo was designed to advertise that Chinese media were full of false reports and vicious propaganda against Honorable Imperial Japan and Japanese media and Information Department needed to fight against such degenerate agencies. Then, Ashihei Hino appeared on the horizon.